Olympic Highway North will be open. The roadway will be reduced to two lanes, one in each direction. 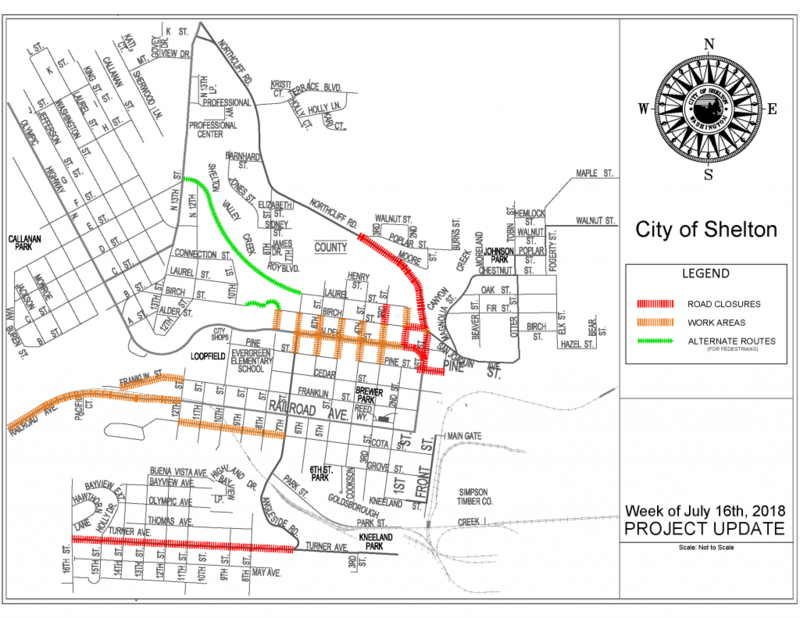 Intermittent closures on Alder St., and adjacent side streets, between 2nd St. and 7th St.
Northcliff Road will be closed between San Joaquin Avenue and Poplar Street until further notice for the installation of a new sewer main. Use Olympic Highway North as an alternate route. Intermittent alley closures between Alder and Pine, and Alder and Birch. Intermittent closures on 1st St. between Pine & Birch, Front St. between Pine & Alder, and 2nd St. between Alder & Laurel. Intermittent closures at the intersections of Pine & 1st, Pine & Front St., 2nd & Alder, 2nd & Birch, 3rd & Laurel, 3rd & Birch, 1st & Birch, 1st & Alder. Intermittent single lane closures at the intersections of 7th & Cota, 7th & Franklin, and 7th & Railroad. Intermittent single lane closure on Franklin St. west of 12th St. Intermittent single lane closure on Railroad Ave. west of 12th St. Intermittent single lane closures on Franklin St. between 9th St. and 11th St.
A single block of Cota St. will be closed between 7th St. and 8th St.
Monday, July 16th: Turner Avenue will be closed from 7:30 AM – 5:30 PM for resurfacing between East Angleside Road and South 16th Street. Tuesday, July 17th – Thursday, July 18th: Turner will be closed continuously for paving between East Angleside Road and South 16th Street. NO TRAFFIC ALLOWED ON TURNER AVENUE DURING THIS TIME. Residents affected by the closure have received notice. As a reminder, residents are advised to park along May Avenue or Thomas Avenue during the closure. It is anticipated that the Turner Avenue project will be complete, and the roadway reopened, on Friday, July 20th.